This fact sheet contains a correction. Last year, the Free Application for Federal Student Aid (FAFSA) helped more than 17 million students access higher education by providing more than $122 billion in federal student aid, including $27.7 billion in grants.1 Yet, every year, the FAFSA also trips students up. Research shows that hundreds of thousands of low-income students lose out on grant aid because they fail to complete the FAFSA, or because they do not complete or verify the information on their form.2 These students leave valuable grant aid on the table and often experience worse completion outcomes than do their peers who receive consistent grant aid each year. With an understanding of these challenges, policymakers have taken aim at the FAFSA over the past decade, looking to reduce the number of questions students must answer in order to receive aid. While shortening the FAFSA is a worthy effort, it fails to address another key way the form can burden students: its frequency. Students receiving federal aid must complete the FAFSA each year, a process that represents a significant investment of time and resources for families, institutions, and the federal government—regardless of the form’s length. Instead, the Center for American Progress proposes a one-time FAFSA, where students would only be required to file the form when they first enroll in college.3 With a one-time FAFSA, students can plan their college career knowing exactly how much aid they will receive, without being burdened by an annual form. Additionally, the federal government and college financial aid offices would experience significant savings from having to administer, verify, and process fewer FAFSAs. The time and money saved could be better spent on additional funding for need-based grants and providing more financial aid counseling for students. The CAP paper is the first to model the feasibility of a one-time FAFSA. Using new data from 27 colleges around the United States covering nearly a quarter-million students, CAP found that half of all students who applied for financial aid experienced a change of $500 or less change to their expected family contribution (EFC), the figure that determines their eligibility for need-based aid. Students who initially received a Pell Grant had EFCs that were even more stable, with 70 percent experiencing a change of $500 or less. Students with $0 EFCs—those who have the most financial need and receive the largest Pell Grants—have the most to gain from a one-time FAFSA. Forty-three percent of students in the CAP study had a $0 EFC when they first enrolled, and almost 90 percent experienced little to no appreciable change in their EFC for the entirety of their enrollment. These data show that requiring students who have a $0 EFC to refile each year is a fool’s errand, with a lot of resources being expended to produce the same result. 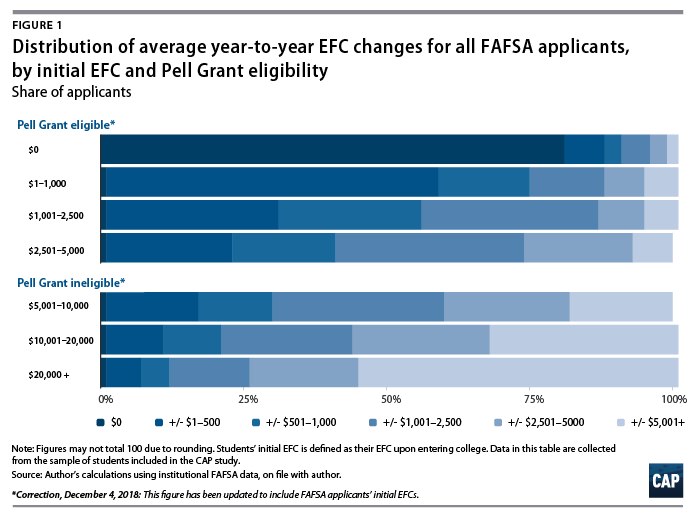 In fact, the students most likely to see a significant EFC change started college with an EFC too high to qualify for need-based federal aid, such as Pell Grants. For them, the FAFSA may be capturing EFC changes that have no bearing on the amount of federal grant aid they receive. Thus, a one-time FAFSA not only works for low-income students, but for higher-income ones as well. While policymakers could consider more targeted approaches, a universal one-time FAFSA provides the benefit of simplicity. Every entity that advises students on applying to college, including the federal government, college counselors, financial aid administrators, and others who counsel students, would have a single message: All students seeking federal aid need only complete the FAFSA one time. With this approach, all students would have stability in terms of the amount of federal aid they receive while enrolled. Colleges and the federal government would also experience a significant reduction in the cost and burden of processing forms and providing technical assistance to students. A universal one-time FASFA is the most straightforward option, but some students would have to refile the form when their circumstances change. For them, an opt-in renewal FAFSA could be implemented; students whose family circumstances or incomes have changed enough to warrant an amended FAFSA could simply resubmit the form with that updated information. Otherwise, financial aid offices could just award students based on their old FAFSA. Students also could be required to file the form when they stop out of college for more than a year, or if they have had a FAFSA on file for more than five years. Policymakers could implement a one-time FAFSA by amending the Higher Education Act. However, the federal government can take a few steps to immediately reduce the application’s burden on students. Instead of students refiling the entire FAFSA each year, the renewal FAFSA could instead be a brief questionnaire that only checks on changes that would affect students’ EFCs by a significant margin. This form could feasibly contain fewer than 10 questions, and most students would likely not need to input any tax information, especially if the form is connected to the IRS Data Retrieval Tool. This policy would be simple to communicate, because there is no process change from the status quo. 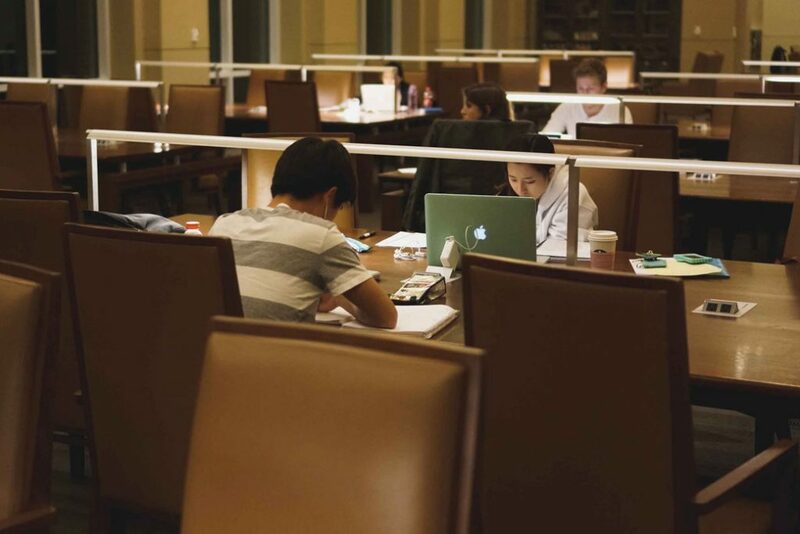 The U.S. Department of Education could also implement an experimental site initiative to test the feasibility of a one-time FAFSA across a variety of colleges. Colleen Campbell is the associate director for Postsecondary Education at the Center for American Progress. Victoria Yuen is a policy analyst for Postsecondary Education at the Center.